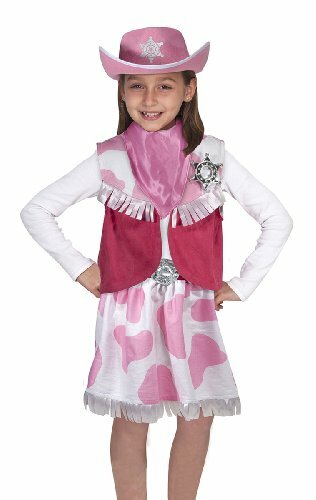 Western Cowgirl Cutie Kids Costume includes cowgirl dress with white top with short puff sleeves, attached layered pink skirt with gingham print, cute cow printed vest, pink neck kerchief and brown cowboy hat. 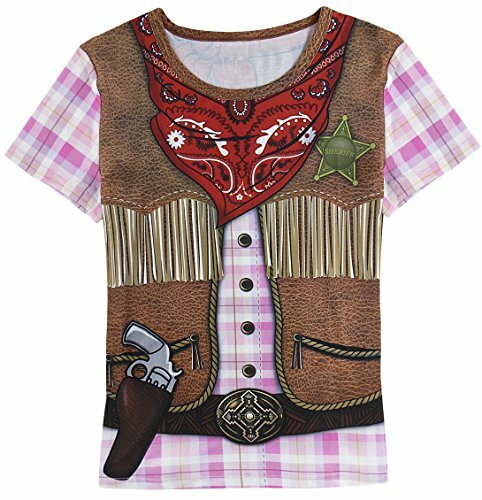 This lovely Cowboy Costume for girls is available in child sizes Small (4-6), Medium (8-10) and Large (12-14). Now you can show the boys you have what it takes to lead the herd! Please note shoes, stockings, earrings, belt and hair bows are not included. 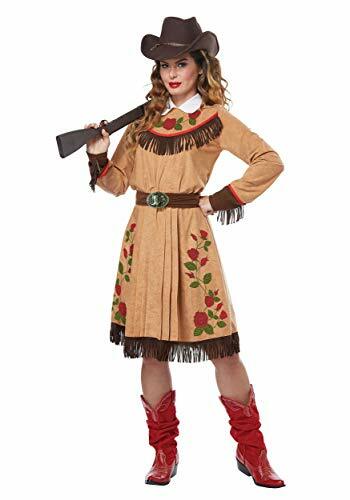 A wild West dress for dressing up as sharpshooter extraordinaire Annie Oakley. 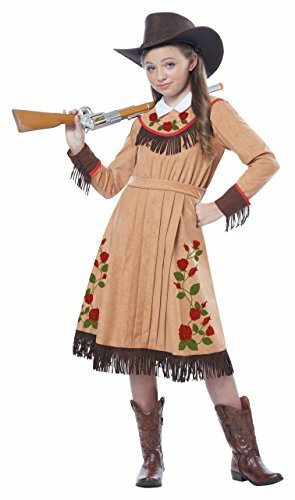 The cowgirl/ Annie Oakley costume includes a pleated dress with an attached white collar and is decorated with rose print and fringe trim. 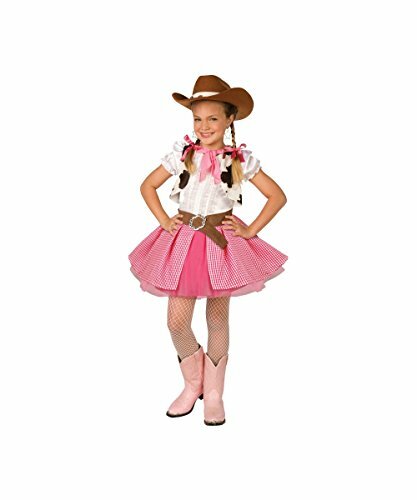 Get ready for a rodeo round up or a fun night of line dancing in this cutie patootie Cowgirl Cutie Costume! Costume includes cute pink and white dress with pink and white checker print and pink tulle and white slip! Attached top with pretty white layered lace down the front with attached pink choker! Belt with sparkling buckle to match brown and black cow printed accents on dress and hat! Yes, quality hat included! Stockings not included. Just the costume you need for Halloween, school plays, character reenactments, parties, parades, family occasions and other holiday productions and festivities! Life on the frontier. Wrangling cattle. Bonfires and whiskey jugs. Seemingly endless rides into the sunset. There's a reason any cowgirl worth her spit would wear chaps while she's out riding the range. You see, when you're up there perched on your trusty steed, your legs are sure to get lit up by that tall brush, mesquite and even cacti if you wrangle down in the Arizona territory. As such, a pair of trusty leather chaps are must-have gear. So when a cowgirl like you needs to suit up and hit the trail for life at the ranch, she'd be wise if she were inclined to choose this Cowgirl Chaps Costume for her next adventure.This look will have you ready to experience life as a cowpoke. And with all the accessories that a bonafide wrangler would wear, you're sure to look like an experienced cattlewoman, even if you're still learning the ropes! Put the cowhide pattern vest on over the western shirt, tie the bandana as desired, and wear them with your favorite pair of jeans. Then just slip on the faux leather fringed chaps and top off the look with the felt Western hat. With a genuine wild West look, you'll feel ready to tackle the herd, the ranch, or even just put those wily cattlehands who've been giving you a hard time in their place. Get this exclusive costume to make your frontier dreams come true. Yee-haw! Is she ready to head to the Wild West? To wrangle bucking broncos and corral cattle? To teach those other cowpokes a thing or two about how to be a top notch frontierswoman? Yee-haw! Let's get her ready for her Western adventure by saddling her up, and by outfitting her with this child Cowgirl's Chaps costume. With this authentic cowgirl look, she'll be ready for whatever kind of Western adventure she can wrangle up in her imagination!This detailed costume has all the signature pieces that a Western wrangler would rock while out working on a ranch or driving cattle. A cowhide pattern vest goes over the classic white western shirt. Faux leather chaps go over her favorite pair of jeans; and a big buckle belt, red bandana and felt hat lets her complete the look just the way she wants. She can build an exciting fantasy with her imagination, participate in a Western group or family theme, or even wear this outfit to the stable when she's getting ready to ride. Whether she's got a real horse to ride or just a pretend one, she's going to feel ready to holler out "Git along, little dogies" and have a good ol' time! Giddy up, little doggie! Live out on the open range - herding cattle, riding a trusty steed across the plains! 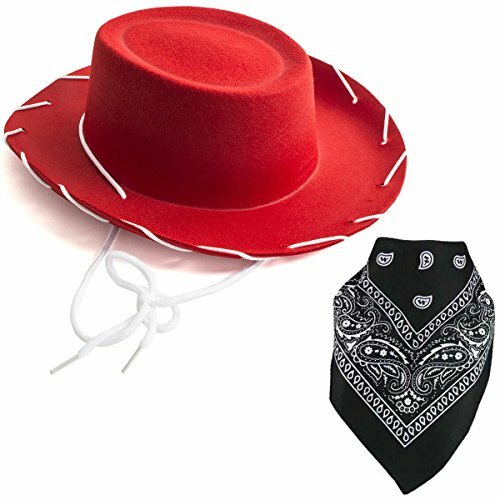 It's a beautiful sight, so why not pick up our Girls Cowgirl Halloween Costume this holiday season?This item features a black, red and white dress with attached vest and belt. 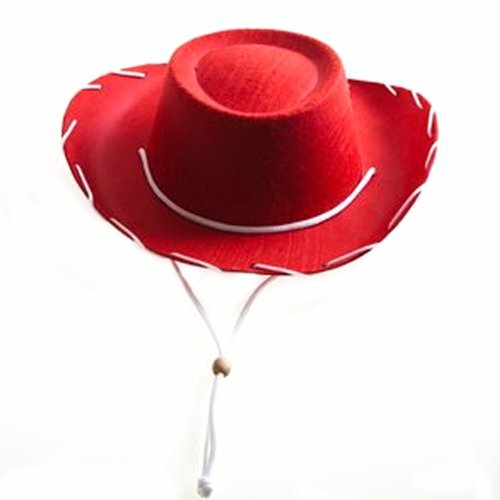 It also includes a black cowboy hat with red trim. When she's out on the ranch, this Girls Cowgirl Halloween Costume is an old west classic! Available at CostumeKingdom.com!!! 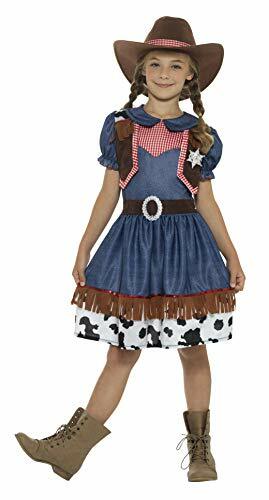 The cowpoke cutie adult size Halloween costume contains a corset belt and dress. Other accessories in the picture are sold separately. This costume is designed for women with a bust size of 34 inches to 38 inches and a waist size from 26 inches to 32 inches. Yeeeee-haw!!! Are you looking to round up an adorable look for your little rascal? Then you need the Cowgirl Costume for Toddlers! Our Cowgirl Costume for Toddlers comes with light brown hat with attached yarn hair, a full dress designed to look like a rustic skirt and plain white shirt, and even an attached vest! This also comes with a black belt! Pair this up with your favorite cowboy boots and toy guns to really knock them over! So, if you're in need of a bulls-eye hit this Halloween season, order this amazing costume today!